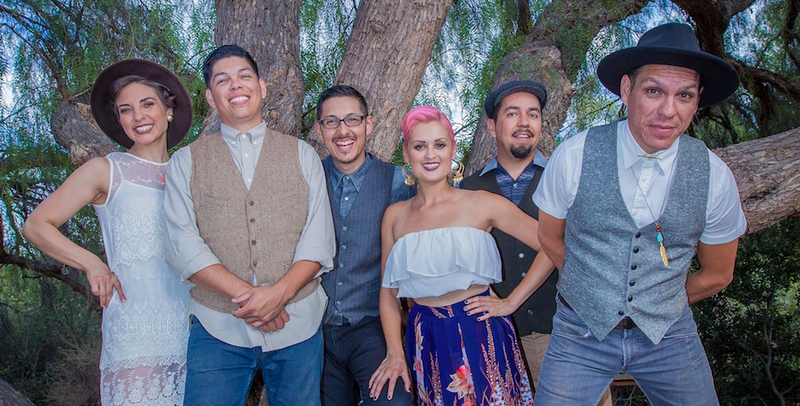 Las Cafeteras have been using their music to tell new and different stories about the Latin/Mexican American/Chicano community since they were formed in Los Angeles in 2008. They have become renowned for spectacular live shows, imbued with an energy that is fiercely compelling, as well as for their vibrant mash-up of son jarocho taken to the Los Angeles streets with touches of punk, rock, cumbia and R&B. Along the way, the band has been no stranger to controversy. In the beginning of their journey, more established traditional ensembles found Las Cafeteras’ free-form mixing of the venerated son jarocho traditions with other grooves unsettling. More recently, the conflicted exit of band member Annette Torres at the end of 2015 and the public debate it generated rocked the musical community that loves their music and their vision. Carlos also expresses disappointment over the way the conflict was framed, saying “This is not a novela!” At the same time she is aware that the expectations for Las Cafeteras were high and perhaps even unreasonably so. She notes that an ardent political activism in search of a more perfect world is an integral part of the band’s persona, and perhaps their fans expected that Las Cafeteras would also always be perfect, a notion she is quick to disprove: “…we are all learning and growing”. She also adds that as a band, Las Cafeteras have had had some lessons to learn: “We are all growing out of oppressive states and we are all claiming our voices and our experiences…for us, we are Chicano, we have had to navigate our own realities and understanding. Each of our feminism in the group is different, but as a collective, we are clear at understanding historical oppression…we can never claim one label for one experience”. It’s all a part of trying to be authentic and honest, says Carlos. This will also be evident in their new album, which she states will be… “a little more authentic to our experience. A little less son jarocho, and more of a remix of our growing up, L.A. R B, cumbia”. She adds that “…the proportions of son jarocho to experimental is different” and that they are adding different musical instruments such as Leah Rose Gallego’s danza azteca instruments. Las Cafeteras will play at Thalia Hall on April 9. Las Cafeteras bring their conscious urban folk to Thalia Hall Saturday April 9.